We live in a world where there are too many dreamers and very few doers. Yes, we see many people, who have dreams but very few are working towards it. The fact is that dreaming is just the beginning; you need to work towards your goal to fulfil your dreams. In order to fulfil your dreams, you have to wake up and start working hard. The question is – What keeps us going? The war is between motivation and habit. We would find people talking about how they wish to become a successful individual but they lack the motivation. They might have the motivation in the beginning but we do not understand a simple fact that habit is what keeps us going. It starts with motivation but if you do not make it a habit, you will never reach where you want to. For example, a person sees fit individuals around him and he/she wants to become as fit! They get the motivation from other individuals. However, the motivation itself is not enough. You would need to develop a habit to get up in the morning, go for a jog, maintain a diet and do all types of workouts. Once you develop a habit of working out and eating healthy, it will keep you going! What keeps us going? It is the habit which keeps us going. 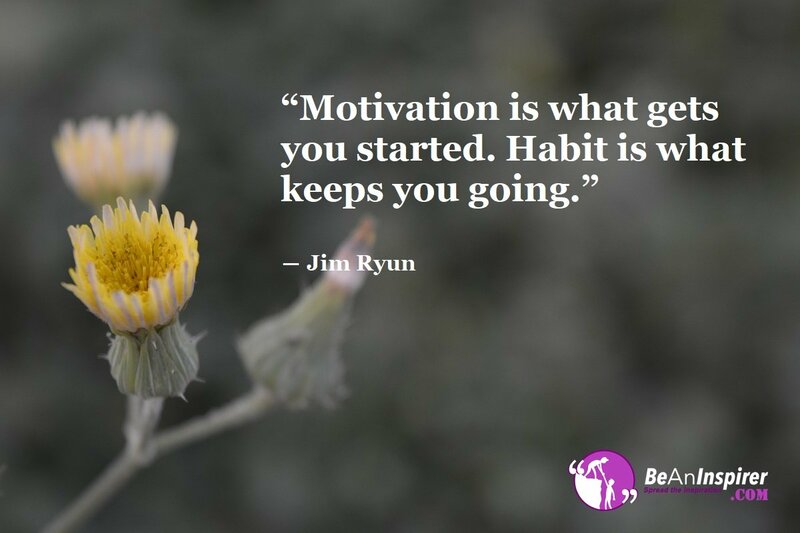 Motivation helps us to get a head start but habit will keep you moving towards the right direction. The key is to find a motivation and then with determination, you would be able to make it a habit. In sports, you might find motivation to try something new and win the match. However, the motivation alone cannot keep you going. Motivation is just the starter! You would need to wake up in the morning, practice the move every single day and then it will become a habit. In order to fulfil your dreams, find motivation and make it a habit. Whether it is slimming down for an event or clearing the UPSC exam, you need to find motivation and then work towards it. Once you start working towards it on an everyday basis, it will become a habit. With small baby steps, you would reach your goal! Motivation V/s Habit – Who wins the Race? What keeps us going? Always remember that motivation alone cannot help you to reach anywhere in life. It is the hard work and habit that counts. In order to crack UPSC, you might find a motivation that motivates you to reach your goal but it is your hard work and habit of studying that will help you reach your true goal. Motivation V/s Habit – Who wins? It all boils down to hard work and dedication. Make it a habit to wake up early, sip some warm water and work hard towards your goal. We would find the source of motivation all around us. Dreaming is just the beginning but what really counts is how badly you want it and how hard you are ready to work for it!